A Nut in the Shell! It's now obvious: I've got a nut in the shell! Mr. G and I are happy, excited, and terrified. Mostly happy. I'm nearing the end of my first trimester, and we have already heard a strong heartbeat at the OB's office. Our little family is growing! From now on, this blog will continue to focus on writing, but it will also discuss a writing parent's juggling act of family, work, and personal wellness. In my opinion, all three aspects of a writer's life must be healthy for the good of the others. Notice I didn't include "fun" in that trio. That's because writing parents don't have time for fun. Anyway, pregnancy so far has made me feel tired and preoccupied enough that I have been taking a break from working on my novel. But this event has also given me a sense of urgency to complete as much as I can before the birth, when I will certainly have less time to devote to writing. So, I'm waiting patiently for the sluggish, nauseous, breathless first trimester to end and the glowing, energetic, magical-super-power-enhanced second trimester to begin (around the Fourth of July). If I receive these legendary benefits of pregnancy, it will be a great time for me to get ahead on my novel and other writing projects. Already, this pregnancy has been a perfect opportunity to focus on my physical health. I'm avoiding many foods, products, and activities that could be harmful to a gestating baby. I've been taking my vitamins and trying to keep up my belly dance exercises as much as possible. All this detoxing and healthy living is good for me and the menfolks in my house, too. And I will probably reap the benefits of feeling great when I get back to writing. 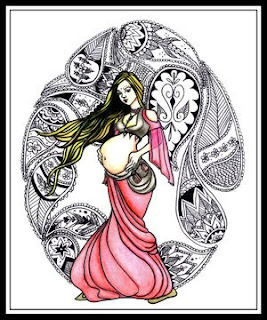 Lately, I've been keeping my eyes open for a prenatal belly dance class in town. YouTube lessons are great, but I would like to get some professional instruction so I can take my dance skills to a higher level, without hurting myself. I've been having some ligament aches and pains already, which are wonderfully alleviated by gentle hip circles and other rounded motions. As my life becomes more complex, I feel that I need to become more simple and efficient to manage it. So I keep three priorities in mind: family, self, and writing, and I try to live in ways that benefit all three. Prenatal belly dance will help soothe my child and ease birth, and it will also keep my body strong and able to recover quickly afterwards. And physical exercise of any kind increases blood flow to the brain and makes me mentally sharper. So even though I'm not writing at the moment, I suppose I'm getting in shape for it. Meanwhile, writing moms and dads, you are my inspiration and proof that it can be done! You are truly magical beings, able to create with both the mind and the body. I feel like I have plenty of good company in the bloglands as I go on this new journey, wondering what I will produce first: a finished novel or a family member? Congrats! My wife is just finishing up her first trimester, too, due in November. We already have two kids, though, 9 and 10, so we know what we're getting into. I'm losing my office -- where I am right now -- to the nursery. It is now "the baby's room," and already has a crib and stroller next to the printer and bookshelf. Onto the couch for me, I suppose. There are no other writing rooms in this 4:2 house. That fills em all. I'll keep writing, late nights and all. I always have. Prenatal belly dancing... I'll have to find that for my girl! She's such a cutie pie, and a great dancer. See if she can stand up and wobble with that big belly of hers. Oh, Genie, congratulations!! That is way wonderful. And good for you for taking care of yourself. The wonderful thing about your manuscript is that it's yours and it will wait for you. I'm thinking about having a contest to change the name of my blog, whatdya think? Check out my post when you get some extra time and let me know if you think I should. You should check out prenatal yoga too. Genie, Michelle told me about this a few days ago, but I didn't have a chance to congratulate you before leaving town. CONGRATULATIONS! I look forward to reading about your life! Yeah, pregnancy is hard, especially the first and last parts. Labor was nothing compared to the long 9-month wait. Good luck on finishing your book! I really hope the 2nd trimester goes well for you. I know that I couldn't function or do much of anything besides read and watch Friends episodes when I was pregnant. I didn't start seriously writing again until my daughter turned 2. Sometimes I still wonder how I get books written! Wow! You and Lexi both post pregnancy blogs in the same week? Is this contagious? CONGRATS Genie-- that's so great. Let's see if I can guess this one, too. I'm taking bets it's a little girl. I've never been wrong yet. Good luck, I'm so happy for you! Eric: Our office is about to turn into a baby room, too. We have a 3-bedroom house and a friend living with us, so we'll be maxed out, too. I guess I'll be writing in the living room! FT: Yeah, I'm keeping an eye out for prenatal yoga classes, too. There are such things that go on in the Lansing area, but only occasionally. Okie: Yes, I'm excited! :) This is all very new for me and Mr. G.
Davin: Oh, good. I'm sure I will be oversharing about various things within the next seven months. I don't know if it's the pregnancy hormones, but I've been having this feeling that everyone is my best friend. I found myself offering to give people on the bus a ride to the airport last night... and then I was like, "What the hell are you doing offering to give strangers rides?" But then it turned out that one of the women I had offered goes to the church where I work, and I know her husband. Maybe it's magical pregnant psychic intuitions. PC: I KNOW, RIGHT? I think she's about one month ahead of me. I have no pregnancy pals in "real life," so I was excited to find out about Lexi's. I had a dream already that it was a boy, but we'll see... You've got a good track record!